Are You Vulnerable to a Climate Change Lawsuit? This post comes from guest blogger Harlan Loeb harlan.loeb@edelman.com, Edelman's Executive Vice President & Director of U.S. Crisis & Issues Management Practice. The flood waters receded along the mighty Mississippi. Now look for a possible surge of climate change-related lawsuits to follow. 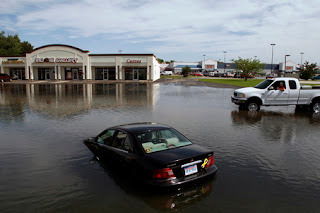 Tort cases brought against companies by stakeholders who claim the companies knew a risk of a major flood risk existed and should have done much more before the deluge to mitigate the damaging effects to business continuity, employee safety and operational stability. The climate change issue is controversial. No agreement exists, to be sure, that global warming is triggering the extreme weather systems that just this year have triggered monstrous tornadoes, torrential rains, record-breaking snowfalls and even months-long droughts. Still, trending data and other signs point to our planet growing warmer as carbon dioxide and other pollutants damage its fragile ecosystem. Whatever is affecting climate change, however, corporate leaders today can’t look backward any longer to historical records. Companies are now expected to be able to anticipate risks that appear to be happening more frequently and more intensely. In other words, companies facing such lawsuits aren’t simply measured on whether they had adequate insurance, financial reserves or cash on hand. Stakeholders will nail them if they knew a risk existed but failed to do the qualitative, values-based analysis that now shapes the corporate character of a company. Some companies such as Chiquita Brands International and Entergy have been working actively to consider ways to decrease their impacts on climate change. Chiquita Brands has led through efforts to conserve water and promote biodiversity. It has joined in the Costa Rican National Climate Change Strategy and participates actively in two environmental working groups dealing with climate change and air quality. For a decade, Entergy, the global energy company, has addressed climate change; since 2001, it has decreased carbon dioxide emissions more than 16 percent below its reduction-campaign goal for the period. · Ensure you have a climate-action plan in place, or develop one if you don’t, and it should focus on capabilities rather than function. · Make sure your board of directors is very involved in the climate change issue; it should consider naming a sustainability or social-purpose expert as a director or an advisor; someone who can wed together the organization’s social responsibility, its operating stability and the qualitative risks it has considered. · Don’t worry solely about risks, but determine what opportunities could develop from putting a climate-action plan in place. 1. The cases are Connecticut vs. American Electric Power, Kivalina vs. ExxonMobil Corporation, and Comer vs. Murphy Oil.